"A Silent Voice" redirects here. For the manga, see A Silent Voice (manga). For other uses, see Silent Voices. 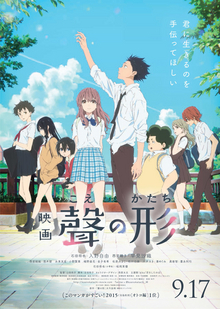 A Silent Voice: The Movie (Japanese: 映画 聲の形, Hepburn: Eiga Koe no Katachi, also translated as The Shape of Voice: The Movie) is a 2016 Japanese animated teen drama film produced by Kyoto Animation, directed by Naoko Yamada and written by Reiko Yoshida, featuring character designs by Futoshi Nishiya and music by Kensuke Ushio. It is based on the manga of the same name written and illustrated by Yoshitoki Ōima. The film premiered in Japan on September 17, 2016 and worldwide between February and June 2017. Japanese teenager Shōya Ishida sets his affairs in order and walks to a bridge, intending to commit suicide. Coming to his senses at the last minute, he hears fireworks as he recalls his days in elementary school and the events that have led him to this point in his life. In those days, Shōya was an indifferent child, one who viewed his fellow students as a way of staving off his boredom. The entry of a new student named Shōko Nishimiya into his class piques his interest when she informs the class that she is deaf. She tries her best to live normally and integrate with the class. However, when the other students and the teacher come to believe her presence is upsetting the social balance, Shōya and Naoka Ueno begin to bully her. When word of the bullying reaches the principal, Shōya is singled out as the culprit. He names his friends as accomplices, but they turn on him, denying their involvement. Soon, the class's bullying is directed toward him, subjecting him to the same treatment he gave to Shōko. Shōya blames Shōko and the two fight after he finds her doing something to his desk. She is subsequently transferred to another school, and he discovers that she was erasing hateful messages his classmates left in chalk on his desk. Shōya finds himself alone, relegated to the role of a tormented outcast. After being thrown in a pond by his classmates, he finds Shōko's notebook. Now in high school, Shōya remains a social reject, having grown to accept his past as punishment. Full of guilt and anxiety, he blocks out the faces of those around him, unable to look them in the eye. Despite his isolation, Tomohiro Nagatsuka, another loner, befriends him and quickly comes to consider him his best friend. Shōya visits the sign language center to return Shōko's once-waterlogged notebook in the hopes of making amends. The two begin meeting at a bridge to feed bread to koi. Yuzuru, Shōko's younger sister, strongly doubts Shōya's intentions. One day, Shōya jumps into a river after Shōko does the same to retrieve a notebook, which happens to be prohibited. Yuzuru secretly takes a photo of Shōya jumping in, and posts it online. Shōya is suspended for the act, and Yuzuru reveals that she was responsible; instead of getting angry, Shōya brings her to stay at his house. When she leaves in the middle of the night, Shōya follows and tells her that he is genuinely remorseful for the way he treated Shōko. Shōko soon gives Shōya a gift and confesses her feelings for him, but because she tries to verbally communicate her affections rather than signing it out, Shōya does not understand her. Worried that the misunderstanding upset her, Shōya invites her to go to an amusement park with him and his group of classmates. There, Naoka finally voices her feelings of hatred in secret to Shōko. In class, desperate to remain blameless for Shōko's bullying, Miki Kawai, another former classmate, exposes Shōya's past to the remaining students who were still oblivious to it, while downplaying her own involvement. The group has a heated confrontation about each member's level of responsibility, ending with Shōya calling out every one of them for who they really are. To cheer Shōko up after her grandmother's death, Shōya takes her to the countryside, where he begins to understand how much she blames herself for everything that has happened to him. Desperate to reassure and change her mindset, Shōya contrives to regularly meet with the sisters. During the fireworks festival, Shōko goes home under the guise of finishing some schoolwork. Shōya follows when Yuzuru asks him to get her camera. When he arrives, he finds Shōko standing on the balcony, on the verge of throwing herself to her death. Shōya succeeds in grabbing her and pulls her back up, but he falls over the side into the river and slips into a coma. One night, Shōko dreams of receiving a farewell visit from Shōya. Horrified, she runs to the bridge where they fed the koi and collapses in tears. Shōya, awakening from his coma in a state of panic, stumbles to the bridge himself and finds her there, huddled in despair. He formally apologizes to her for the way he treated her, and for the many things he did which may have caused her to hate herself. He asks her to stop blaming herself, and also admits that, while he once considered giving up himself and ending his own life, he has since decided against it. Shōya then asks her to help him continue to live. When Shōya goes to the school festival with Shōko, he finds out how much his friends from elementary school still care for him and all of them are reconciled. Afterwards, Shōya requests them that the group should go to the school festival together. During the festival, Shōya finally overcomes his past mistakes and is finally able to look at other people's faces, as he cries and realizes that he has obtained redemption and found forgiveness at last. A high school boy who bullied Shōko in elementary school along with his friends, who turned on him when he attempted to reveal their roles. Now a social outcast, he strives to make amends with Shōko. A deaf girl who transferred to Shōya's elementary school, where she was the victim of constant harassment by Shōya and her classmates, forcing her to transfer again. Now in high school, she visits the sign language center with her sister Yuzuru. Shōko's younger sister who is skeptical of Shōya's attempts to meet Shōko. Due to her boyish look, Shōya initially assumes she is dating Shōko, a lie she continues until she reveals herself. She regularly takes photos of dead creatures to show Shōko the morbid reality of death. A rotund high school boy who befriends Shōya after he prevents his bike from being stolen. Tomohiro is defensive toward Shōya, often confronting others involved with him. Shōya's elementary school classmate who joined him in bullying Shōko. In the present, she works at a café and attends a different high school. Although she is apologetic for her actions toward Shōya, she remains antagonistic toward Shōko, blaming her for what has happened until she is confronted by Shōya's mother at the hospital that Shōya was staying at. One of the few classmates in Shōko's elementary school who was friendly to her; the two reunite years later. A classmate of Shōya's from elementary to high school; she vehemently denies her involvement in Shōko's bullying. A high school boy who befriends Shōya. Shōya's elementary school friend and accomplice in bullying Shōko. After Shōya attempted to expose his role in harassing her, he led his former friends in bullying Shōya in response. He currently works at an amusement park. One of Shōya's friends in elementary school who later turned on him alongside Kazuki. Shōya's teacher in elementary school. Although he opposed Shōya's harassment of Shōko, he made no effort in intervening until the principal confronted the classroom. Shōya's mother who runs a hair salon. Shōko and Yuzuru's mother, she disapproves of her daughters meeting Shōya and demands them to stop, though they refuse. Maria's mother and Pedro's spouse. Shōya's niece and the daughter of his older sister and Pedro. Shōko and Yuzuru's grandmother, who lives with the family and bought Yuzuru her first camera. The anime adaptation of the manga was announced in the manga's final chapter that released on November 19, 2014, later specifying that the adaptation will be an anime theatrical film on December 17, 2014. In the Weekly Shōnen Magazine's 46th issue of 2015 that released on October 14, 2015, Kyoto Animation and Naoko Yamada were announced to be the animation studio and director of the film adaptation, respectively. The film's distributor, Shochiku, listed the adaptation releasing in Q4 2016. On April 8, 2016, the film adaptation's official website opened, announcing that Reiko Yoshida would write the scripts for the film, Futoshi Nishiya would designed the characters and the film was scheduled for release in Japanese theaters on September 17, 2016. Kensuke Ushio and Pony Canyon composed and produced the music, respectively. The film's theme song, titled "Koi wo Shita no wa" (恋をしたのは), was performed by Aiko, while "My Generation" by The Who was used during the opening credit. For the English dub, deaf actress Lexi Cowden was cast as Shoko. The film premiered in 120 theaters across Japan on September 17, 2016. It was screened at the 2016 Scotland Loves Animation festival on October 22, 2016, and at the ICA in London on February 5, 2017. Anime Limited distributed and released the film in the United Kingdom and Ireland on March 15, 2017. Purple Plan released the film in Singapore and Malaysia on March 9, 2017. Madman Entertainment released the film for a limited duration in Australia and New Zealand from April 9, 2017 and April 16, 2017, respectively. In 2017, Konnichiwa Festival released the movie in theaters in Mexico, Brazil, Chile, Colombia, Costa Rica, El Salvador, Guatemala, Honduras, Panama and Peru, for a limited time in May, while in countries like Argentina and Uruguay, the film was released by Anifest having a theatrical release in June. Pioneer Films released the movie in the Philippines on May 10, 2017 nationwide. The film had a screening at Anime Expo on July 3, 2017, and the film had a limited release in U.S. theaters in October 20, 2017. The Blu-ray home video release volume was released in Japan on May 17, 2017, which contains two animated videos of the film's theme song and "Speed of Youth", one of the original soundtracks by composer Kensuke Ushio. Shout! Factory released the film on DVD and Blu-Ray in North America on April 2, 2019. The film opened at #2 at the Japanese box office behind Makoto Shinkai's Your Name, and grossed a total of ¥283 million from 200,000 admissions within two days of its premiere across 120 theaters. As of November 30, 2016, the film has grossed a total of over ¥2.2 billion from 1.7 million admissions. It ranked at #16 on Nikkei Hit Ranking for 2016 from East division. It was the 19th highest-grossing film in Japan in 2016 and also the 10th highest-grossing Japanese film of the year in the country (tied with Death Note: Light Up the New World), with ¥2.3 billion ($19.56 million). In China, the film grossed CN¥44.5 million ($6.7 million). It also grossed $310,407 in the United States and Canada, $110,552 in the United Kingdom, $437,577 in Bolivia, New Zealand, Paraguay, Spain and Thailand, and $5,471,482 in other territories, bringing the film's worldwide total to approximately $33 million. Makoto Shinkai, director of Your Name, called the film a "fantastic piece of work" and a "polished and grand production" which even he is unable to replicate. It won Best Animation of the Year in the 26th Japan Movie Critics Awards, where director Naoko Yamada also received praise for her work on the film. At 2017 Annecy International Animated Film Festival, the film was selected as one of the nine feature films in competition. On review aggregator website Rotten Tomatoes, the film has an approval rating of 93% based on 29 reviews, and an average rating of 7.5/10. The website's critical consensus reads, "As beautifully crafted as it is powerfully written, A Silent Voice looks at teen bullying from a soberingly hard-hitting perspective that's uncommon for the animated medium." On Metacritic, the film has a weighted average score of 78 out of 100, based on 10 critics, indicating "generally favorable reviews". ^ "A SILENT VOICE". British Board of Film Classification. February 8, 2017. Retrieved December 13, 2018. ^ Green, Scott (August 7, 2016). ""A Silent Voice" Anime Movie Listed For Over Two Hours". Crunchyroll. Retrieved August 7, 2016. ^ "映画「聲の形」(2016)". allcinema (in Japanese). Stingray. Retrieved September 22, 2016. ^ a b c "A Silent Voice Anime Film Stars Miyu Irino, Saori Hayami". Anime News Network. May 27, 2016. Retrieved May 27, 2016. ^ a b c d e f g "A Silent Voice Anime Film Reveals Trailer, More Cast, New Visual". Anime News Network. July 8, 2016. Retrieved July 8, 2016. ^ a b c d e f g h i j k l m n o p q "'A Silent Voice' UK Home Video Details". All The Anime. September 26, 2017. Retrieved September 26, 2017. ^ "A Silent Voice Manga Has Anime in the Works". Anime News Network. November 17, 2014. Retrieved April 8, 2016. ^ "A Silent Voice Anime Project Is a Theatrical Film". Anime News Network. December 15, 2014. Retrieved April 8, 2016. ^ "Kyoto Animation to Produce A Silent Voice Film With Director Naoko Yamada". Anime News Network. October 11, 2015. Retrieved April 8, 2016. ^ Green, Scott (December 27, 2015). ""Silent Voice" Anime Movie Listed For Fall 2016". Crunchyroll. Retrieved April 8, 2016. ^ a b "A Silent Voice Anime Film's Visual, Teaser Video, Release Date, More Staff Revealed". Anime News Network. April 8, 2016. Retrieved April 8, 2016. ^ "aiko to Perform A Silent Voice Anime Film's Theme Song". Anime News Network. June 27, 2016. Retrieved August 17, 2016. ^ "A Silent Voice Anime Film Reveals Trailer, More Cast, New Visual". Anime News Network. July 8, 2016. Retrieved August 17, 2016. ^ "A Silent Voice English Dub Clip Features Lexi Cowden as Shoko". Anime News Network. October 10, 2017. Retrieved June 15, 2018. ^ a b "A Silent Voice Anime Film Earns 283 Million Yen in 2 Days, Ranks #2". Anime News Network. September 20, 2016. Retrieved September 20, 2016. ^ "Extra Silent Voice and Your Name Screenings at Edinburgh Scotland Loves Anime". Anime News Network. September 30, 2016. Retrieved March 5, 2017. ^ "A Silent Voice in Japanese Film Tour". Anime News Network. January 10, 2017. Retrieved March 5, 2017. ^ "A Silent Voice UK and Ireland Cinema Details". Anime News Network. February 22, 2017. Retrieved March 5, 2017. ^ "Koe No Katachi (A Silent Voice): Finally Premiering In Singapore & Malaysia On 9 Mar 17". HYPE & STUFF. February 24, 2017. Retrieved March 14, 2017. ^ McCallum, Jessica (March 2, 2017). "A Silent Voice is Heading to Australia and New Zealand This April". Madman Entertainment. Retrieved March 5, 2017. ^ "Koe no Katachi // Una Voz Silenciosa". www.konnichiwafestival.com. Archived from the original on July 31, 2017. Retrieved April 19, 2017. ^ "Pioneer Films re-schedules "A Silent Voice" anime movie premiere to May 10". Anime Pilipinas. May 2, 2017. Retrieved May 3, 2017. ^ "Anime Expo 2017: A Silent Voice Coming to U.S. Theaters". The Outerhaven. July 1, 2017. Retrieved August 23, 2017. ^ "A Silent Voice Anime Film's Blu-ray to Add 2 New Animated Videos". Anime News Network. March 13, 2017. Retrieved April 25, 2017. ^ "A Silent Voice Film Earns 2.2 Billion Yen, Sells 1.7 Million Tickets". Anime News Network. December 2, 2016. Retrieved December 4, 2016. ^ "横綱は『君の名は。』と『ポケモンGO』、嵐は大関". Yahoo! Japan (in Japanese). December 5, 2016. Retrieved December 5, 2016. ^ "Top 20 Highest-Grossing Films in Japan Has 6 Anime Films". Anime News Network. December 18, 2016. Retrieved December 20, 2016. ^ "声之形（2017）". Cbooo (in Chinese). Retrieved September 18, 2018. ^ "A Silent Voice". EntGroup. Retrieved December 16, 2018. ^ "A Silent Voice (Koe no katachi)". Box Office Mojo. Retrieved December 16, 2018. ^ "Koe No Katachi (2016) - International". The Numbers. Retrieved December 16, 2018. ^ @shinkaimakoto (September 7, 2016). "映画『聲の形』試写で観てきました。素敵な作品でした。どこまでも真摯で丁寧な組み立てで、絵も色彩もエモーションに美しく奉仕していて。上品で端正な演出は、真似したくてもとても真似られそうもなく。キャストも皆素敵でしたが、個人的には入野自由さんの芝居に度肝を抜かれました。すごすぎ。" (Tweet) – via Twitter. ^ Rei, Serena (May 17, 2017). "A Big Movie Hit – Anime Movie 'A Silent Voice' Wins Best Animation of the Year". AnimeCon.org. ^ a b "A Silent Voice Animated Movie in Competition at Annecy". Anime News Network. Retrieved June 11, 2018. ^ "A Silent Voice (Koe no katachi) (2017)". Rotten Tomatoes. Fandango Media. Retrieved April 10, 2018. ^ "A Silent Voice Reviews". Metacritic. Retrieved February 21, 2018. ^ "第26回受賞作品" (in Japanese). Japan Movie Critics Awards. ^ "第40回 日本アカデミー賞 優秀賞一覧" (in Japanese). Japan Academy Prize. January 16, 2017. ^ "第71回毎日映画コンクール 心に迫る一本　日本映画大賞・日本映画優秀賞候補作" (in Japanese). Mainichi Newspaper. December 16, 2016. ^ Megan Peters (December 22, 2017). "The 2017 ComicBook.com Golden Issue Awards Nominations for Anime". Comicbook.com. Retrieved July 3, 2018. ^ Egan Loo (October 7, 2017). "Fate/Apocrypha, Sword Art Online Movie Win Top Newtype Anime Awards". Anime News Network. Retrieved June 23, 2018. ^ a b "TAAF2017アニメ オブ ザ イヤー部門グランプリは『映画『聲の形』』と『ユーリ!!! on ICE』に決定!" (in Japanese). Tokyo Anime Award Festival. February 22, 2017. ^ Lisa Dietrich (March 17, 2018). "Man braucht mehr solcher Filme". Leipzig lauscht (in German). Retrieved July 5, 2018. ^ "The 20th Japan Media Arts Festival Award-winning Works" (PDF). Japan Media Arts Festival. ^ "第26回受賞作品" (in Japanese). Japan Movie Critics Awards. Retrieved June 11, 2018. ^ Amid Amidi (April 27, 2017). "Annecy Unveils Full Lineup Of 23 Animated Features". Cartoon Brew. Retrieved July 3, 2018. ^ Jackie Keast (October 13, 2017). "'Sweet Country' earns three Asia Pacific Screen Awards nominations". if.com.au. Retrieved June 14, 2018. ^ "50 International Film Festival of Catalonia- Sitges 2017". Filmaffinity.com. Archived from the original on June 22, 2018. Retrieved June 21, 2018. ^ "Feature Film 2017". Anim’est International Animation Film Festival. Retrieved July 8, 2018. ^ Ard Vijn (December 5, 2017). "Have Your Say: The Future Of Anime Is Bright". Screenanarchy. Retrieved July 8, 2018. ^ Sebastian Wienecke (February 28, 2018). "Crunchyroll Anime Awards 2018 – Das sind die Gewinner" (in German). Moviepilot.de. Retrieved June 14, 2018. ^ "26 ANIMATED FEATURES SUBMITTED FOR 2017 OSCAR RACE". Academy of Motion Picture Arts and Sciences. November 9, 2017. Retrieved June 14, 2018. ^ Joey Nolfy (November 10, 2017). "Angelina Jolie, Pixar projects among 26 films submitted for animated feature Oscar". Entertainment Weekly. Retrieved June 14, 2018. ^ Teapot, Demelza (January 24, 2018). "Announcing the Anime UK News Readers' Choice Awards Winners!". Anime UK News. Retrieved July 8, 2018. ^ Mercedes Milligan (March 5, 2018). "MONSTRA Fest Grows Up with 18th Edition". Animation Magazine. Retrieved July 11, 2018. This page was last edited on 11 April 2019, at 00:28 (UTC).